This lease addendum is designed to be an attachment to an office lease. It provides nonexclusive parking rights to the tenant, while giving the landlord broad flexibility to change the nature of parking arrangements for the property. 1. Parking Spaces. At all times during the Lease Term, and conditioned upon the Lease being in full force and effect and there being no uncured default as defined the Lease, Landlord hereby agrees to make available to Tenant ___ parking permits, of which ___ parking permits shall be allocated to the garage associated with the Building and ___ shall be allocated to the surface of the Land (i.e., outside the garage). None of the permits will be for reserved spaces. 2. Parking Rental. During the primary term of this Lease, i.e., the Lease Term specified in the Lease, no rentals shall be charged for the parking permits. 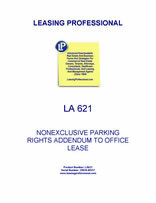 If Tenant exercises its renewal option pursuant to the Lease, then during the renewal term the rent for all parking permits which are allotted to Tenant pursuant to Paragraph 1 immediately above shall be the rate which is from time to time designated by Landlord as standard for the Building. During any such renewal term, Landlord shall provide Tenant at least thirty (30) days notice of any change in the parking rates, and Tenant shall pay the adjusted rent after the expiration of the thirty (30) day notice period. All payments of rent for parking spaces shall be made (i) at the same time as each Base Rental is due under the Lease and (ii) to Landlord or to such persons as Landlord may direct from time to time. 3. Parking; Allocation Devises. Landlord reserves the right to change its system for allocating parking spaces, e.g., magnetic parking cards, parking stickers and other devices or forms of identification. If Landlord issues magnetic parking cards, parking stickers or any other device or form of identification, they shall remain the property of Landlord and shall not be transferable. Tenant will be obligated to pay a replacement charge, equal to the amount posted from time to time by Landlord, for loss or other replacement of any magnetic parking card or parking sticker issued by Landlord.